The House Intelligence chairman seems more interested in being an asset to Trump than overseeing his administration. In the intelligence community, we were taught that the most valuable information an officer can collect is both relevant and actionable — relevant to policymakers and actionable in the sense that it presents them with an opportunity to do something to advance America’s national security interests. But it’s not just intelligence professionals who’ve learned this lesson. Since the Watergate era, Congress has played an indispensable role overseeing our intelligence and law enforcement agencies, and national security professionals are required by statute to keep Congressional officials informed of their activities, as appropriate. When I was a CIA analyst, though, I viewed such briefings — like Thursday’s meetings between the FBI, Justice Department, intelligence community officials and Congressional leaders — as mere routine. They mostly afforded a more candid, behind-closed-doors view of our elected officials: The brilliant, the hypocritical and, all too often, the disinterested. I am confident, however, that Thursday's briefing for House Intelligence Committee Chairman Devin Nunes, who orchestrated the opportunity, featured no shortage of interest — but only because it wasn't about legitimate Congressional oversight. To the contrary, Nunes and his Congressional accomplices have essentially turned the oversight process on its head. It’s now Congressional Republicans who appear to be trying their hand at intelligence collection, playing the role of informants for the White House by collecting on our own national security professionals’ investigation into President Trump’s circle. Nunes and his Congressional accomplices have essentially turned the oversight process on its head. It’s now Congressional Republicans who appear to be trying their hand at intelligence collection. We’ve seen this before: Last year, Nunes took it upon himself to engage in the style of subterfuge and deceit that would make an intelligence professional proud — assuming that said intelligence professional were truly terrible at his job. In an effort to justify Trump’s baseless claims that Trump Tower had been “wiretapped” (which conveniently shifted the storyline away from the mushrooming Russia probe) Nunes ditched his staff and took a late night Uber to the White House complex. 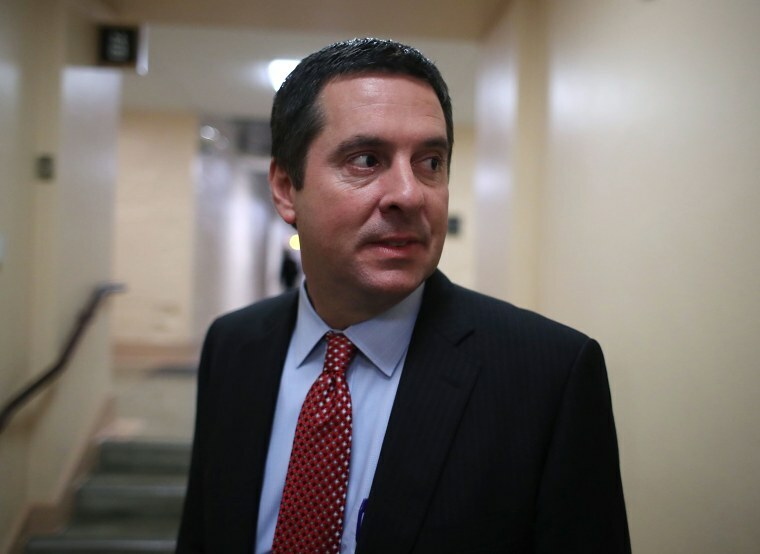 It was there that a still-officially unknown official or officials provided him with intelligence that would come to the form the crux of Nunes' erstwhile shiny object: The so-called “unmasking scandal,” in which the names of Trump campaign officials, whose information was collected in the course of monitoring foreign officials, were provided to Obama-era policymakers. Nunes (who had served on Trump’s transition team) then ostentatiously rushed to the White House the following day to brief officials on what he had “discovered” when, in truth, he laundered intelligence back to its original source. Unfortunately for Nunes, his first attempt at a covert action came to a crashing halt after his actions were called into question. He even became the subject of a now-closed House Ethics Committee investigation into whether he had divulged classified information. Just over a year later, Nunes seems to be back to his old antics and engaging in the same activities that his committee is charged with overseeing, not executing. Nunes for weeks called for Thursday's meeting — even to the point of threatening to impeach or hold in contempt top Justice Department officials — because he recognized the intelligence goldmine the briefing presented. The White House, too, had been eager to pave the way for a successful operation, including by taking the extraordinary step of initially limiting this briefing to lawmakers of only one party, the GOP. (The administration ultimately relented and allowed Adam Schiff, the ranking Democrat on the House Intelligence Committee, to sit in on the briefing and arranged a separate session with a broader swath of bipartisan Congressional leaders). We can be confident that the last-minute addition of Schiff didn't deter Nunes from his mission: To provide the White House with additional details of the FBI’s investigation into the Trump campaign — potentially including specifics of the alleged use of an informant. In fact, Schiff’s presence may offer Nunes plausible deniability when he inevitably leaks cherry-picked details to help the administration shape the public narrative. The White House, meanwhile, has never been more in need of Agent Nunes’ services. With Mueller racking up 22 indictments or guilty pleas and federal authorities in New York zeroing in on Trump’s personal attorney, Michael Cohen, the administration is desperate for intelligence it can spin and then weaponize to undermine the ongoing probes. Trump has already taken to Twitter to decry “SpyGate,” his moniker for the FBI’s reported attempts to learn about suspected Russian agents who also happened to be associated with Trump’s campaign. Nunes, following Thursday’s meeting, almost certainly is equipped to provide the White House with relevant and actionable information, dutifully playing the part of an increasingly seasoned operative. In this case, however, the end goal of amassing this intelligence isn’t to advance our national security; it’s to undermine the rule of law. Ned Price served as a special assistant to President Barack Obama on the National Security Council staff, where he also was the spokesperson and senior director for strategic communications. Prior to serving at the White House, Price was at the Central Intelligence Agency. He currently directs policy and communications at National Security Action, is an NBC News analyst and contributor and teaches at Georgetown University.